One Hot Stove: Simple Dinners: Potato "Song"
Friday nights, I often plan my dinners around finishing stuff from the fridge, getting ready for Saturday (market-day). Last night, a quick peek in the fridge revealed 3 boiled potatoes (left over from a few days ago), some left-over crushed tomatoes, half an onion. Plus some ready-made rotis (Indian flat-breads). One easy recipe jumped to my mind: Potato "song", a Konkani (a coastal region of India) potato curry with a wonderful sweet-spicy-tangy medley of tastes. I have no idea why the curry is called "song"; it is a recipe my Konkani grandmom had taught Anji (our cook) to make, so it would be on the menu often. This curry uses the simple trio of red chillies-cumin-coriander for its spice base, jaggery (unrefined/brown sugar) for the hint of sweetness, both tamarind and tomato for the tang and cilantro for the fresh note. The result is delicious. I am experimenting with a different way of writing this recipe, breaking it down, so to speak, so maybe it will be easier for readers unfamiliar with Indian cooking to see how a curry comes together. It might make a long list of ingredients seem less daunting. Let me know if it helps or not. Almost all curries have these 5 components: a main ingredient, a tempering, spices, curry base and garnishes. The different permutations and combinations of ingredients and spices is what makes each curry unique. 1. Mix all the ingredients for the curry base and set aside. 2. Start with the tempering. Heat the oil in a saucepan, and then add all the tempering ingredients. Stir them around so that they flavor the oil, keeping the heat medium. 3. Add all the spices and saute for a few seconds so they toast and release their flavors. 4. Add the potato cubes and saute for a minute. 5. Add curry base, stir around, bring to a boil and simmer for 5 minutes. 6. Taste and adjust the balace of salt-spice-sweetness-sourness if necessary. 7. Garnish with fresh cilantro. This curry tastes better if you let the flavors blend for 15-20 minutes after cooking. 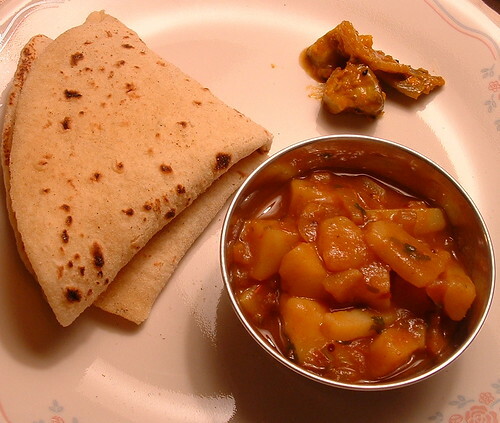 Enjoy with flatbreads/rotis or steamed rice, with a dollop of pickle and some yogurt. There: a simple dinner and some good use of left-over bits of food! This looks like a really delicious meal, Nupur. nupur,I really enjoy your blogs,esp the a-z marathi food and the write ups before the recipes. But i was especially delighted to see Konkani food featured a couple of times..moog ambat and potato song brought back fond memories of home!.thanks !.and looking forward to more! This looks like a simple but yummy dish. Keep up the great work Nupur! Sounds very tasty! Such an interseting post! Sounds tasty , will try this today. Could you please post the recipe for Solkadi . I'm just starting to learn more about curries and the flavors of India, this sounds delicious and will be added to my list of recipes to try. Hi Poornima, yeah, I love konkani food...I made some cucumber pancakes (tausalli) and moongdal-ghassi before, and I think those two are also konkani. Hi Anu, glad you liked it! Hi Kalyn, thanks for stopping by! Hi Rorie, so glad you liked it ! Hi Michele, I'm sure the journey discovering the tastes of India will be a delicious one! Hi Nupur! I do like the recipe format - it helps to understand why it is constructed as it is (and maybe... one day... make me feel comfortable improvising). This looks so good! This recipe is great. I made twice the amount (doubling everything) and it worked out really tasty. Hi. I would like to make friends with people who enjoy indian cookery. I've joined this site (indian cookery) to try to meet some new friends but I wondered if you knew of any other such sites. Good-bye 2005...with a favorite dish!